If you have just finished reading John Doerr’s “Measure what matters”, or any other OKR book, you may be filled with a lot of enthusiasm to start using OKRs right now. Not so fast. In order for OKRs to work, they must be set up correctly. 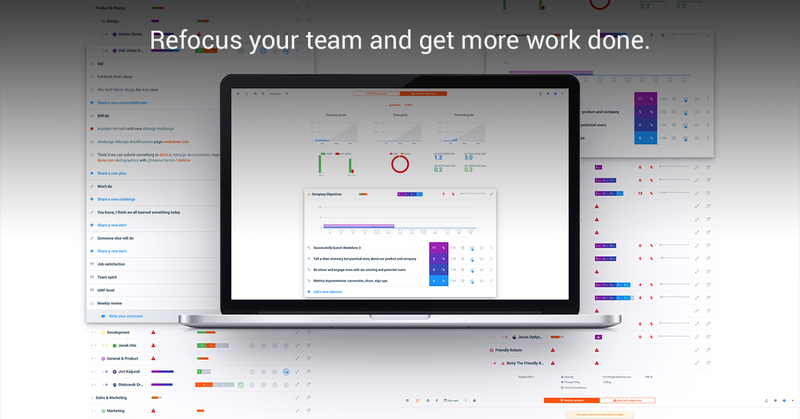 In working with thousands of clients we’ve put together an optimal timeline for implementing the OKR system. 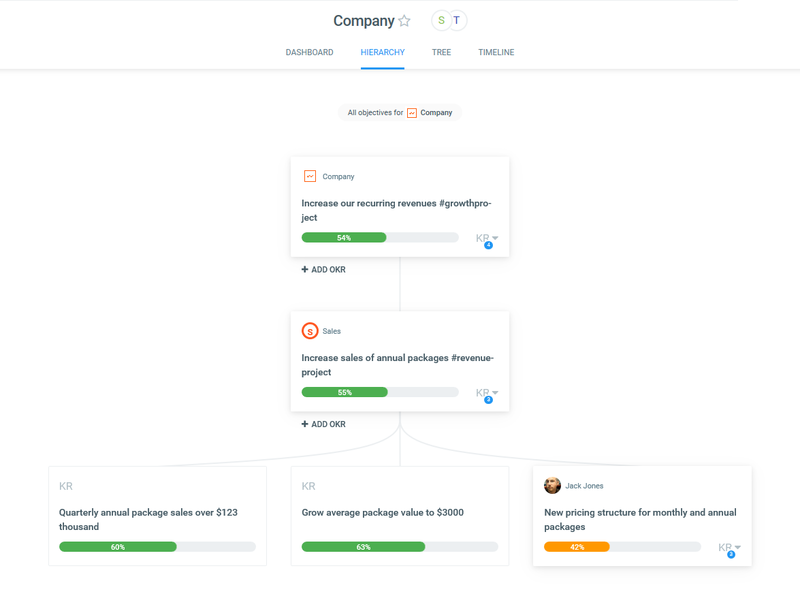 Deciding what system works best for your company. 1 – 2 Weeks before starting your first quarter of using OKRs. the management team should decide if their company objectives are going to be annual, quarterly, or a mixture of both. Slow changing companies might opt for annual OKRs over quarterly. Especially if moving from a more traditional model of using mission and vision to define company goals. Fast changing companies would do better using just quarterly OKRs. Companies that want to focus on high level long term goals, while also having the flexibility of fast changing quarterly goals, would opt for a mixture of both. Generally speaking, when both annual OKRs and quarterly OKRs are used, the annual objectives are defined first. Then each quarter new objectives are defined to support the annual objectives. The Management team should have a meeting to set 3 Objectives for the company to focus on the quarter. This meeting can consist of solely higher level management, higher level management and team leads, or everyone in the company depending on the size of your company and your culture. Everyone should come to the meeting with ideas about the goals they believe the company should focus on this quarter. You will then discuss and prioritize them until the 3 most important objectives are chosen. It’s important to not have too many objectives the first quarter, as this can cause an extra layer of confusion and complication when implementing OKRs for the first time. Simple is better to start with. Additional objectives can be added in subsequent quarters. Once everyone feels more comfortable with using OKRs. Moving down to team level. Once the company objectives are set, these objectives should be communicated to team leaders. Team leaders should then identify the 1 – 3 most important objectives for their team this quarter that will contribute to the company level Objectives. Ideally, in order to come up with their Objectives, the team leader should have a meeting with their entire team to brainstorm ideas. These team objectives will act as the Key Results of the company level Objectives. Not every company level objective has to be supported by every team. Some teams might find that all of their objectives are only related to one company Objective. This is fine. Team level Key results can also be brainstormed at this time and assigned down to team members as objectives. 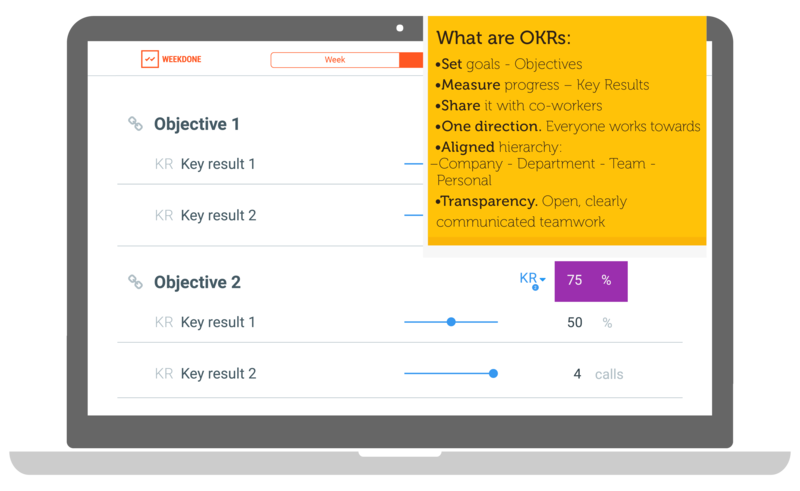 If you are implementing personal OKRs this quarter, no team member should have more than 3 personal objectives. Personal OKRs can be the hardest to implement when your team is still learning the system. Good news is, that you don’t need to implement personal OKRs right away. Having OKRs on just the company and team level is fine to start. You don't need to aign all Team KRs down to the personal level. If it doesn’t make sense to make a team KR a personal objective, then it can be left at the team level. The team lead will just need to update the progress on the unassigned team KR’s on a weekly basis. If you really need those personal OKRs. In order to have meaningful objectives for everyone, your team leads should have 1 on 1 meetings with their direct reports. This helps to finalize personal objectives and personal key results. Each person should ideally have no more than 3 Key Results to support their personal objective. Finally, once all of the Company, Team, and Personal OKRs have been set, the management and team leads should have one more meeting. There they can to go through the OKRs together and make sure they are in sync. This meeting is the perfect opportunity to give feedback to everyone on their goals. And to make sure they are written properly. If anyone has OKRs that are written incorrectly, you can discuss and brainstorme together until the OKR can be fixed. Remember to follow us on Twitter, Google+ and Facebook for all about okrs, objectives, key results and more! We're also on LinkedIn and Slideshare, posting about OKR - Objectives & Key Results, Internal Communication, Collaboration & Teamwork. Subscribe to our Leadership Academy newsletter on building great companies for more tips about OKR - Objectives & Key Results, Internal Communication, Collaboration & Teamwork. 23,300 awesome subscribers.